Now that you have made your final decision on a puppy we have options available to make your purchase process go smoothly. Placing a deposit on a puppy is your commitment to purchase. Life is unpredictable and sometimes things happen and we will work with anyone - I will not refund however because you simply change your mind. We will move your reservation to a future litter if your deposit has been in place less than 3 weeks. I will not hold a puppy for 6 weeks and move a deposit. In order to reserve a puppy, you will need to fill out an Application so that we have your contact information. Once we receive that, we will contact you to discuss any questions we have concerning the puppies new home or to answer any questions you might have concerning your new pet. Our shorty Jack puppies & Hunt puppies are priced individually. Your deposit of $200.00 (which is non refundable) will hold your puppy until it's six weeks old. At that time we ask for the balance and shipping to be paid so that we can get your puppy readied for it's trip home. Prices vary depending on quality, coat type, blood lines and age of the puppy. Please trust our judgement and experience when we price our puppies. We will never misrepresent a puppy. Please be sure and note your puppies name or nickname on the application. We accept All major Credit Cards, Cash, US Postal Money Orders, Personal Check, and Certified Bank Cashier's Check. If you choose to pay with a personal check, there will be a 10 day hold on the puppy until the check has time to clear. In placing a deposit with us, you are directing us to pull a puppy off the market and reserving it for you. Should you change your mind on that particular puppy, you forfeit your deposit or it may be moved to another puppy depending on the age of the puppy at the time that decision is made. I will not hold a puppy for 6 weeks and then move a deposit. We honor deposits on first come first serve basis. Micro chipping done at owners discretion. Our puppies are registered with the EJRTCA or the AHTCA and when possible, we will send papers with your puppy. If we haven't received them from the registry, they will be forwarded to you as soon as we get them. 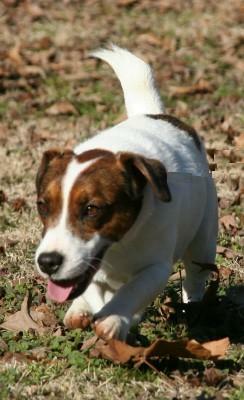 Hobbit Hill Jack Russells will be here for any of our customers should you have any problems, questions, or just anything we can help you with. We value the families who purchase our puppies and will always be up front and honest with you. We are proud of the puppies we produce and proud of the wonderful homes where they become family. Click here to find out more about registering your new puppy with the EJRTCA. We do not HOLD puppies without a deposit period. Currently we are limiting our shipping to the USA and Canada - we will not ship to Hawaii. (overseas shipping may resume at a later date).